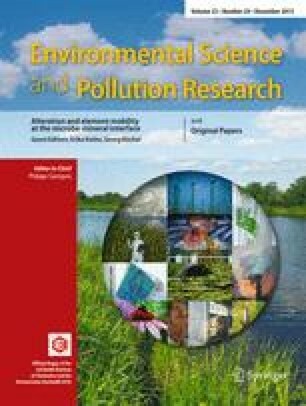 Atmospheric mercury deposition by wet and dry processes contributes to the transformation of mercury from atmosphere to terrestrial and aquatic systems. Factors influencing the amount of mercury deposited to subtropical forests were identified in this study. Throughfall and open field precipitation samples were collected in 2012 and 2013 using precipitation collectors from forest sites located across Mt. Jinyun in southwest China. Samples were collected approximately every 2 weeks and analyzed for total (THg) and methyl mercury (MeHg). Forest canopy was the primary factor on THg and MeHg deposition. Simultaneously, continuous measurements of atmospheric gaseous elemental mercury (GEM) were carried out from March 2012 to February 2013 at the summit of Mt. Jinyun. Atmospheric GEM concentrations averaged 3.8 ± 1.5 ng m−3, which was elevated compared with global background values. Sources identification indicated that both regional industrial emissions and long-range transport of Hg from central, northeast, and southwest China were corresponded to the elevated GEM levels. Precipitation deposition fluxes of THg and MeHg in Mt. Jinyun were slightly higher than those reported in Europe and North America, whereas total fluxes of MeHg and THg under forest canopy on Mt. Jiuyun were 3 and 2.9 times of the fluxes of THg in wet deposition in the open. Highly elevated litterfall deposition fluxes suggest that even in remote forest areas of China, deposition of atmospheric Hg0 via uptake by vegetation leaf may be a major pathway for the deposition of atmospheric Hg. The result illustrates that areas with greater atmospheric pollution can be expected to have greater fluxes of Hg to soils via throughfall and litterfall. Higher GEM concentrations and deposition flux in southwest forest due to emission of atmospheric Hg in fast development areas of China. Litterfall is the dominant input pathway. Coal consumption is dominated by domestic use, and it often rises in summer causing the elevated atmospheric Hg. This study was supported by the Natural Science Foundation of China (41103040), the National Basic Research Program of China (973 Program, 2013CB430003), the Natural Science Foundation of Chongqing city (No. cstc2011jjA20007), and the Fundamental Research Funds for the Central Universities (XDJK2013B044).